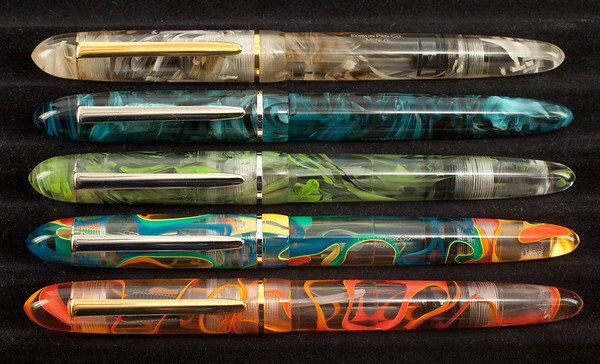 We are packing now for the Michigan Pen Show! We should be set up by 3:00 today (Friday), and then we’ll be set up all day Saturday. We’ll have a bit less than 200 pens with us, including some pretty phenomenal new materials that we’ve made into some Menlo Draw Fillers! See the photo below to check out some of these new materials. As opposed to many of our previous translucent materials, most of these have a clear base material, rather than tinted. This really makes a pretty incredible appearance in my opinion! When these pens are filled with ink that’s sloshing around inside, they will look pretty amazing as the ink will show through better than typical! That rainbow swirl looks amazing. Nice work! How much does one of these beauties cost? Hi Chuck. $350 with a steel nib or $450 with an 18k nib. Thanks! Brian, what’s the name of the material for the two pens on the bottom? Hi Ian. Honestly we haven’t formally named them yet, but if you are interested, just reach out. Ohhhh my!!!! Those are stunning pens!!! Good luck at the show! Those new materials are impressive to see. I really like that blue!